Theft and Vandalism – Vacant houses always seem to draw in people that want to see if there are any contents or construction materials such as copper pipe or copper wire they can take. Or, sometimes people just want to vandalize a house. Not only can the city hold you responsible to keep the property condition up, you could be liable for anyone on your property if they get hurt. Trespassing or Squatting – Anyone that goes to your vacant property to try and take something will be trespassing. Hopefully the neighbors will call the police. Squatting, or occupying a vacant house without any right to do so, can be a big problem. From fires inside the house in winter that can catch the house on fire to people not having proper bathroom facilities, squatters can cause serious problems to a vacant house. Water or Fire Damage – Water damage can be caused by faulty swamp coolers, leaks in the roof, plumbing issues and so on. All of these issues can cause mold problems, and it can start with a simple faucet left on or a leak in your roof. Fire damage can be caused by lightning, squatters trying to keep warm or kids playing with matches inside the vacant house. Neglecting Regular House Maintenance – When you are living in your house, those small repair items that come up every day are usually taken care of right away before they get worse. With no one at the house, the little things will often grow into big things. Weather – Even after short periods of vacancy, vacant properties are at the mercy of the weather. We have talked about the water damage that is possible, but wind is probably the most destructive to a vacant house. It can tear shingles off your roof, cause shutter or rain gutters to become loose and fall off your house or start to loosen your siding. The wind might even cause part of a tree to fall on your house. The wind, rain and snow can also make your house obviously appear that it is vacant. Yes, there is a vacant house behind all the over grown bushes. We would love to make you an offer on your vacant house no matter what the condition is. 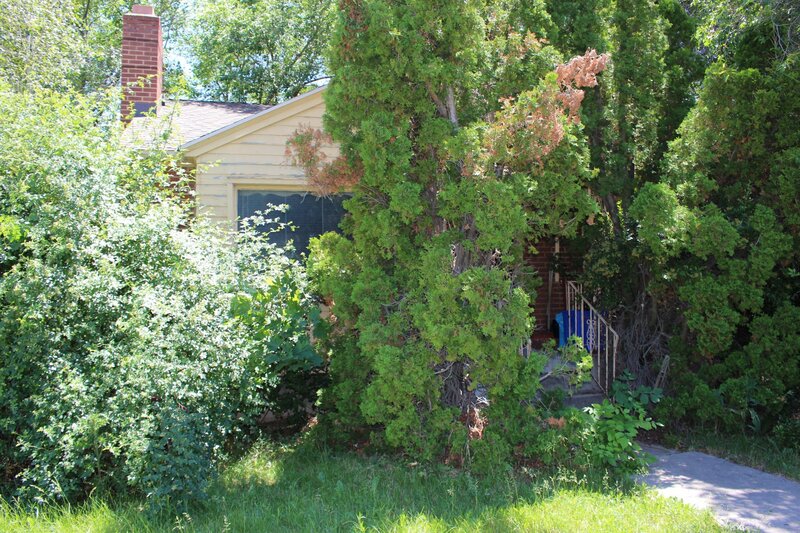 Even if the house is in great condition, we can help you sell a vacant house quickly. Please call us at 801-382-9199 or fill out the form below. I look forward to talking with you. Are You Thinking You Want to Sell a Vacant House? Having an appraisal done will give you a general idea of what your house is worth. You can use the appraised amount of your house to help you negotiate the list price with a realtor or to negotiate a sales price with a professional house buyer. At Gary Buys Houses, we can give you an appraised value at no cost just like an appraiser. We both use the exact same data to get the value. Whether or not you plan to make repairs before you sell your house, make sure to get repair estimates. And, it is a good idea to get price estimates from more than one company or person for major repairs like a roof or plumbing or electrical issues. If you plan to sell the house, this will give you leverage in negotiating the sales price since you know exactly how much the repairs will cost, or how much you paid for them. Not only will keeping the utilities on help prevent weather damage, but if they are left off, it gives buyers the impression that the house needs more repairs than it actually does. Keeping utilities on will also make it more comfortable for anyone looking at the vacant house you are selling. If you do not complete all the repairs, make sure you disclose all the repairs needed and any other issues with the house to the buyer of your house. You could be found liable for problems you did not disclose, even in an as-is sale. Typically professional house buyers will inspect a house they are buying and allow the seller to agree in writing to waive all disclosure requirements. Make sure to secure the house in order to prevent damage from weather, squatters, trespassers, criminals and other vandals. Please call us at 801-382-9199 or fill out the form below to talk to us about selling your vacant house today.